Paradise on the Gulf Coast! Sarasota is a great place to live, work and enjoy the Florida lifestyle so we will be including a variety of information about living in Sarasota in our blogs. Beaches, Parks and Recreation, Arts and Entertainment and Golf just scratch the spectrum of things to do in Sarasota. Both US News and World Report and the Today Show have done stories about Sarasota REAL ESTATE. 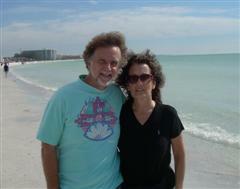 They both agreed that Sarasota is the Best Place in the USA to Buy REAL ESTATE! Which means YOU will Get the MOST VALUE for your Money! I have been selling second homes & investment properties as well as residential real estate since 1986. My expertise in marketing and negotiation has helped hundreds of people realize their dreams through buying and selling residential, & vacation homes as well as commercial property & vacant land. I am Larry’s Marketing Director (assistant). It is my job to be sure things run smoothly and that Larry provides the Best Quality of Service Possible. *Larry Lists and Sells Houses. He makes sure that the client’s needs are met. *Ann does the background work so that Larry can give clients Outstanding Service.